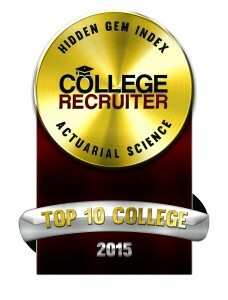 Minneapolis, MN, April 20, 2015 — College Recruiter, the leading niche job board used by recent college graduates to find entry-level jobs and students to find internships, today announced the 12 winners of its 2015 Hidden Gem Index for the best colleges and universities for employers who want to hire high quality graduates who majored in actuarial science. As the economy continues to slowly improve, so do the prospects for entry-level job candidates who are expected to benefit from companies’ need to rebuild “bench strength” after cutting millions of workers during the recession. However, while this year’s crop of 1.7 million college graduates should fare slightly better than last year’s, the job market will remain fiercely competitive, according to a new outlook from global outplacement consultancy Challenger, Gray & Christmas, Inc.